Is it customary to tip the staff workers in camp? Yes. Like any place you go on vacation and receive excellent customer service, the staff here greatly appreciate being tipped for the long hours of hard work they put in to ensure that your vacation is satisfying, enjoyable and that they have exceeded your expectations in service. What kind of tackle should I bring? First, if you have a portable depth finder they are very helpful (on any body of water) to know what depth of water you are fishing. If you do not have one, we have them for rent in camp on a first come, first served basis. The above three lure types/presentations probably account for 90-95% of the walleye our guests catch from camp the entire season. For northern pike, our guests will cast or troll a variety of large crankbaits including: Believers, Grandmas, Suicks, Sand Cats, Rapala Husky Jerks, Super Shad Raps etc. in popular colors such as silver, gold, black, perch, firetiger etc. Big spinner baits and spoons are also productive in a variety of colors with silver, gold and firetiger/chartreuse being very popular. A supply of 8-12″ steel leaders are good for pike fishing, and some “jaw spreaders” can make hook removal from these toothy creatures much easier. Although a lot of our walleye fishing is shoreline related and just outside of weedbeds, marker buoys are another handy item to help mark the many offshore reefs, humps etc. that are common on Wabaskang Lake when the fish have moved out of the weeds, as well as a handheld GPS unit to allow you to easily return to such hot spots. Are there any weight restrictions on the boat-in trip? The basic answer to this is “no”. We can (generally) transport 8 guests and their gear into camp on a trip. That said, because we are boating in, we do request guests to carefully consider what their true needs will be for their stay in camp. Elimination of extremely heavy gear is very much appreciated, as is the use of canned beverages for the week which is MUCH lighter than bottles and much easier (and safer as bottles tend to break) for us to “boat-out” the trash as we do every week. While this is not “mandatory” we really do appreciate our guests limiting the amount of bottled beverages they bring on their trip. What are the fishing license options for me in Ontario? Ontario sells two different 8 day fishing licenses for non-residents. 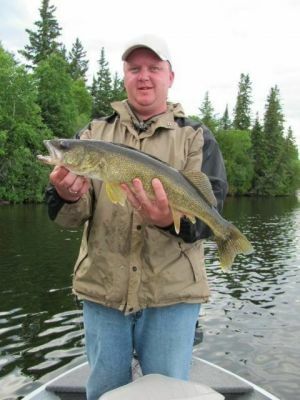 The first is referred to as the Sportsman’s License (cost about $48.00 US) and allows the license holder to possess 4 walleye, 4 northern, 4 smallmouth, 2 lake trout and 50 perch. The second license option is the Conservation License (cost is about $30.00 US) with the limits being one half of the Sportsman’s License. Besides my fishing gear what else should I bring? Other items guests should include on their checklist are as follows: Bath and dish towels, a Personal Flotation Device (PFD) for everyone in the group, your fishing license, all personal hygiene items (soaps, shampoos, toothpaste, etc.). In addition, some other basic things to remember are: personal medications, sun tan lotion, bug spray, chap stick, good rain gear, clothes for a variety of temperatures, and your camera and film. Please refer to our Trip Planning Checklist on this website for additional suggestions. Do you, the camp owner, reside at the camp for the entire season and will our group be dealing with you while we are in camp? Yes, we do reside in camp the entire 18 weeks of the camp season and will be available for your group during your stay with us. We wouldn’t have it any other way. I remember planning my own trips to Canada, knowing the importance of picking the right place when you look forward to those 7 days in Canada the “other” 358 days of the year. Short of controlling the weather, we will do everything we can to ensure you get the most out of your trip to camp. The fishing will take care of itself, Wabaskang Lake is a quality fishery. The service is up to us, and we guarantee you will receive personal service from us and our staff to make your trip satisfying and enjoyable. How bad are the bugs (mosquitos and black flies)? Despite being in a remote wilderness setting, the mosquitos are typically not bad at all. Honestly, I get more mosquito bites at home in Northern Indiana than in camp. First light and last light periods are when you will have them around, otherwise during the day you most likely will not ever see one (unless you go into the bush). The black flies tend to be around some during the warmer summer months (July and August), but they are not real thick. Personal checks are accepted for deposit only. Final payment upon check out must be made in cash or travelers checks. Do your cabins have inside bathrooms, hot showers, electricity and private bedrooms? Despite our remote wilderness environment, our cabins are modern. They do have inside bathrooms with hot and cold running water, flush toilets and hot showers. Electricity is provided 24/7 via generator. All cabins have private bedrooms with the exception of Cabins #1 and #5 which have one large bedroom. What all is included in the shore lunch kits provided by the camp? Your shore lunch kit will come complete with everything you need other than your food items. You provide the fish, cooking oil, fish batter, side dishes etc. Otherwise, the kit will include all your cooking utensils, plates, cups, silverware, matches, salt & pepper etc. all arranged in a nice, easy to carry wooden shore lunch box. How do I coordinate pick up at your roadside dock? Guests should call us from Vermilion Bay, Ontario (corner of Hwy 17 and Hwy 105, Red Lake Road) in camp at 807-222-3184. IMPORTANT: This is the only phone that rings outside on the camp property on pickup day, therefore it is the ONLY number that we are available to answer on Saturday mornings. Once you have called camp, you are only 45 minutes from the landing and I will have adequate time to make it across the lake to pick your group up at the roadside dock. On Saturday (check-in) if you unload in advance of my arrival, please put your gear on the right-hand side of the dock in the event I am bringing a group out. This will ensure enough space to accommodate both parties. Groups are welcome in camp anytime on Saturday morning after 6:30 a.m. However, early arrivals may be told that their cabin is not quite cleaned and ready for them. Your boat, however, will be clean, gassed and ready to fish. Most early arrivals will just fish for a couple hours and then come back to camp to get settled into their cabin. What is the best time of the year to come up fishing? Generally speaking, our fishing on Wabaskang Lake is very good all season, however it does vary some based on the species you are most targeting. For walleye, the first six weeks of the season is generally outstanding fishing. Our August/September walleye fishing is a close second to our May/June fishing in terms of number of fish caught, and the average stringer weight is definitely heavier. July walleye fishing can also be outstanding, but anglers often find the “mid-day” bite in the heat of summer to be slower. Those who are willing to fish earlier in the morning and again in the evening hours often do VERY well. Northern pike are voracious feeders and are caught all season long. Although we see trophy size fish (>40 inches) caught all season, our best trophy northern fishing is from early July thru about the first week of September. Smallmouth bass fishing is excellent early in the season, generally slows down around the mid-June spawn and then gets going again by July 1. By July, there are usually 3-5 pound smallmouth lurking right under the camp docks that provide a lot of fun for guests and especially the kids right off the dock. Perch fishing is really good all season long for the anglers who target them. 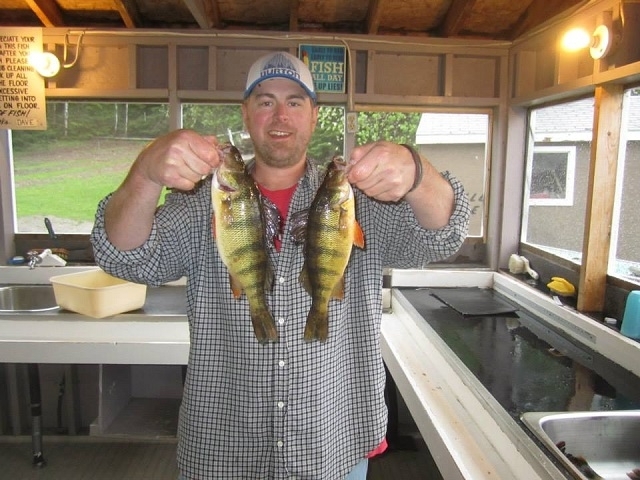 Our lake has a huge perch population in it, so our guests success fishing for them is largely dependent upon taking a little time to specifically fish for perch. Lake trout can be caught in the shallow waters around Wabaskang Lake and specifically at Hobson Falls during the first week (sometimes two) of the season and again during the last week of camp. Otherwise, the best lake trout fishing would be the deeper waters in Wine Lake which is accessible to guests via an easy portage. How many lakes are accessible to fish from your camp? From camp you will have access by boat or portage to the following lakes: Wabaskang, Wine, Beaver, Halversen, Anishinabi, Ghost, Lost, Ruby, Keynote, Dowell and Mud Lakes. There are no additional costs associated with any of the portage trips from camp. How safe is the lake to navigate and how safe are your boats? Wabaskang Lake for a Canadian shield lake is as safe to navigate as you could hope to find in terms of rock shelfs etc. Lower unit busters are rare and most are well marked. There are some open expanses of Wabaskang that can become dangerous during very high winds, however, there are also many islands, points, bays and coves that will allow you to escape the wind and fish in safe conditions that are located close to camp. 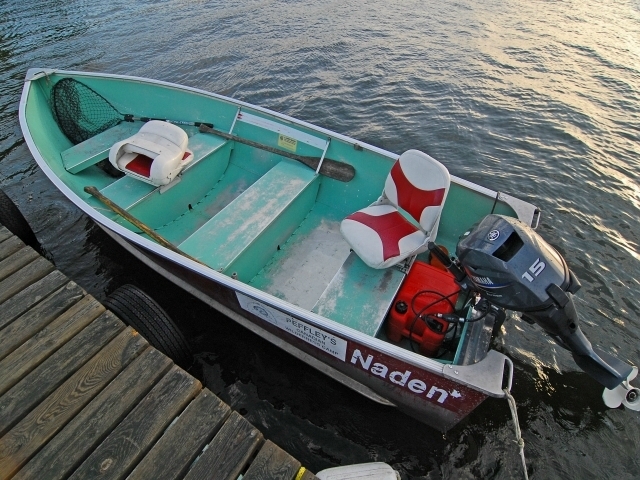 Our boats are 14 and 16 foot Naden Boats that are wide, stable and have flat bottoms for your safety and deluxe high-back cushioned swivel seats for your fishing comfort. All our boats are equipped with reliable, new or nearly new 15 and 20 hp Yamaha four stroke outboards. 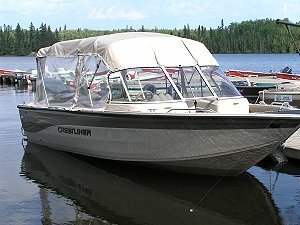 CLICK HERE for photo of one of our 14 foot fishing boats. Do you supply the boat seats and is there an extra charge for them? Yes, your boat will come equipped with deluxe, highback, cushioned swivel seats for your fishing comfort, andNO there is not an extra charge for them. At Peffley’s Wilderness Camp, we are proud of the investment we make in our guests comfort by providing them a high quality cushioned boat seat for those long days on the water. For more information about the high quality boat seats we furnish in our boats CLICK HERE. What if I forget a grocery item or something else? We maintain a limited supply of basic groceries items in the main lodge in camp (soft drinks, milk, eggs, butter, canned goods, fish oil etc.) for guests to purchase. In the event we do not have what you are in need of, we do make a trip to town at least once a week and would gladly pick up some items for guests. Can I bring my own boat up to camp? Yes, we have many guests who do so every season. I will still meet your party at the roadside dock and have you follow me out to camp. Once in camp- you will have complete dock facilities at your disposal including electricity for battery charging etc. See the “Our Rates” page of the website for package pricing and our July Specials for bringing your own boat and if you are a veteran or active military personnel. Do you offer guide service from camp? No, for two primary reasons. First, Wabaskang Lake is a very easy lake to fish and has abundant populations of all game species, and secondly because we have such good fishing close to camp our guests are very successful using the well-marked lake maps that I will review with them. We can stand in camp together and I will be able to literally point you to at least half a dozen places (visible from camp) where we consistently catch fish. Our review of the lake map won’t just be a point to a “general” area of the lake. It will include specifics on exactly what to look for on a shoreline, what water depth has been productive, what baits/colors have been effective, is jigging or trolling working better right now etc. If a group does struggle finding and catching fish after a day or two in camp (which RARELY happens), I will go with them to put them on fish. Through the years, even first time guests are almost always successful in catching plenty of fish to eat (usually 2-3 times a day) catching plenty to take home their legal limits, AND still releasing lot’s of fish throughout their stay. I have over 20 years experience fishing Wabaskang myself and am in constant contact with our guests throughout the week regarding the fishing, so I am well prepared to give our new guests great advice on where to get started catching fish Day One. What other amenities are available in camp? Despite our remote wilderness setting there is phone service available in camp. I suggest our guests bring a calling card to most easily use the service. Collect calls can also be made from the camp phone. Wireless internet access IS available in camp-free of charge. Propane and charcoal grills are available for guests to use in camp. Propane, charcoal and starter fluid is provided. Shore lunch kits are available for guests to use upon request at no charge. Electricity at the docks for battery charging etc. Ice is available for sale ($2.75) bag in the main lodge. Fish finders are available for rent by the day ($10.00) or week ($50.00) in camp. 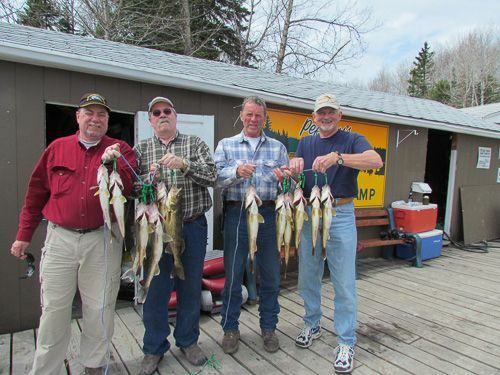 Downriggers and related gear are also available for rent in camp to assist guests in their quest for lake trout once the water has warmed and the lakers are deep. There are two private 3 piece showerhouses available for guests to use as an overflow for their group. If I am considering a trip to your camp, how far in advance can I make a reservation? Like most camps, once a guest has a cabin for a week with a paid reservation, they will have first right to rebook that same cabin for the same week the following year. What I recommend to prospective customers is to determine the week for the next year you are interested in and as soon as that week has passed in the current year, call me in camp to discuss a possible booking for the next year. This is critical to try to obtain a reservation in the months of May, June and August, but certain weeks in July and September can also be very popular and therefore hard to reserve. Do I need a passport to enter Canada and return to the USA? Yes, for air travel into Canada and return air travel to the U.S. Entry by land will require a passport effective June 2009. Do you sell live bait in camp? Minnows are flown into camp by my supplier on a weekly basis and are available to guests. The current price for minnows is $4.25 dozen. (subject to change based on supplier pricing). Nightcrawlers can be transported across the border provided they are in artificial bedding or they can be purchased once you arrive north of the border in Canada. I have questions about crossing the US/Canada border? For official guidance on questions such as what can I bring across the border, what you should know about crossing the border etc. CLICK HERE. In the unlikely event of a medical emergency, how can you provide emergency response? Despite being in the wilderness, we can have you in the hands of trained medical personnel in basically the same amount of time as if you were staying at a roadside camp. We alert the Ear Falls, ON ambulance service (25 miles north of us) of the emergency upon departure of camp in the passenger boat–in the amount of time it takes (20 minutes) to transport your ailing group member to the roadside dock, the ambulance service can be there ready to assist. What is the weather going to be like on June 15, 2015?